Who in their right mind would learn to ski at age 65? A man with a mission and that man happens to be my husband – Jay. He never learned to ski as a kid even though he grew up about an hour away from the ski resorts at Lake Tahoe, California. His family didn’t ski – they were avid golfers and played virtually year round. None of his childhood friends skied so he never thought much about it, until now that is. His motivation is a little pig-tailed three year old named Norah (our granddaughter). You see, Jay doesn’t want to be the grandfather waiting in the lodge for everyone to finish skiing – not that the lodge isn’t nice — but he wants her to remember them skiing together. He wants to share memories of mugs steaming with hot chocolate and marshmallows at Cushing’s Cabin. In order to do that he needs to be good enough to not just to ski the mountain himself but to be able to take care of her safely also — follow her through the trees if need be. He knows has a long way to go since he is starting at square one but that’s not stopping him. There is no better time than the present to get started so he signed up for a Max – 4 “first time on skis” lesson and was greeted by Deer Valley ski instructor, Peggy Philbrick who just so happens to love first time skiers. He was joined by a couple fellow novices for the lesson — Danya from Las Vegas and Megan from Birmingham, Alabama who were both excited to learn to ski. Peggy made Jay completely comfortable from the minute he clicked his boots into the bindings and headed to the skier conveyor where first time skiers move to the top of the run. Peggy explained the importance of rising up to a standing position with skis parallel and letting them float down the hill. Then after gaining speed slow down by using the wedge. These novices repeated this time after time to really feel the experience of skiing while adding in right and left turns. In a little over an hour, they were making nice wedge turns and skiing in control. Jay came home tired but very happy from the lesson. The next day, Jay and I skied together to practice his new skills on the gradual slope of the Wide West beginner run at Snow Park. I followed him watching in amazement at how he maneuvered his turns around the cones — practicing his turns. He looked so relaxed! I could tell that he will be a pro in no time not just because of his determination but because he really was having fun out there. Since we moved to Park City, inevitably the topic of skiing comes up with just about everyone we talk with. Surprisingly, I have heard more than one person say they don’t ski because they are too old. Too old? I am not talking about sixty year olds here, these are forty year olds talking to me. Really? Too old? Maybe they have no idea that age is a state of mind. * being open to new experiences. * skiing during a snow storm to experience fresh powdery snow. * riding the lift when it is five degrees out and seeing snow speckles resembling diamonds. Being young means learning to ski at 65 and carrying a little girl wearing her princess ski helmet to the car after a magical day of skiing with her grandfather who learned to ski just for her. What a great post! Good for you, Grandpa Jay! DV instructors are terrific. Way to go! I feel the same way! I want my grands to remember that their grandmother got them going @ age 5. There is nothing greater than them ‘getting it’, watching them make turns, ride the chairlift for the first time, and their thrill at flying down the mountain with me in pursuit. Makes being a grandparent all the more special! It’s never too late for a lot of things! Good for grandpa Jay for getting out there and showing them how it’s done. I hope he will be showing off on the slopes for his graddaughter soon! Happy trails! That’s one lucky little girl to have grandparents like that! Deer Valley sounds like a perfect place to ski for beginners and experts alike. Great story! Kathy, I totally agree with you — I want to be there with them when they learn to turn and ride the lift. It will be an incredible experience. With my husband learning, of course, I get to enjoy skiing with him but it will be amazing to have both of us out there having fun with the grandchildren as they come along. 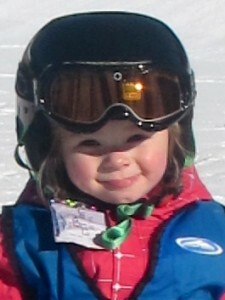 Watching the little ones learning to ski at Deer Valley always puts a smile on my face! Way to go! 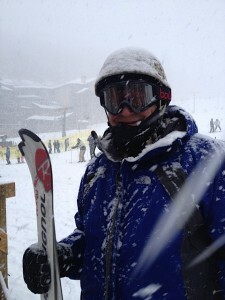 I returned to skiing after an almost 40 year break (wasn’t very good back then!) with the help of Deer Valley’s Erin O’Shea, She is a star – giving this 56 year old heaps of confidence. Have fun at DV with your gorgeous grand daughter! I have to agree with you about the DV instructors — they have helped me tremendously, too. Super stoked that you are learning to ski at 56! Love it! What lucky grandkids! I love your posts! Way to go Jay! I can say that I have been skiing since high school and at age 69 it still has the timeless excitement and enjoyment that seems to redefine itself each season. Sharing this with your granddaughter just makes it better!! What memories she will take with her as she grows up! And Deer Valley is the best place in the world for us to ski Jay! Take it from me : you have many wonderful ski years ahead of you! Have a great off season and hope to see you on the slopes next year! Jay you will never regret your decision. I am now 78 and didn’t start skiing until I was 65. We live in Oklahoma and grandchildren live in Dallas, TX and Portland, OR. and it is convenient for all to get here. We bought a condo in PC to “bribe” our grandchildren to visit us; it worked, and everyone loves spending time winter and summer. 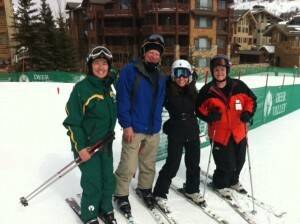 I plan on skiing with our family for many years. My husband Ray took up skiing at 61 when we first met. I told him I had a condo in PC and had gone out every year for over 30 yesrs, had never been disappointed and wanted to continue my yearly trips out there with or without him. He bravely accompanied me and started on the beginner slope. After a year of skiing alone, one day he just decided that he had enough and challenged himself to go down Big Stick eight times. When I joined him for lunch he announced that he was going to ski with me and so he has every year for 16 years. We are now 78 and 75 with one knee replacement and always get first tracks. Loved reading this story! I’m 65, husband is 67. Our son, daughter in law and 4 grandchildren have invited us to go skiing with them in February to Deer Valley. While we both are very excited, I’m secretly a little nervous about skiing. We both skied once, 10 years ago. My husband was awesome, he’s in very good shape and it came natural to him. I was in terrible shape, 15 pounds overweight and fell more than I skied. But I’m in much better condition now and I’m excited to try again. I will definitely start with lessons! Thank you for this encouraging message! I have 4 precious reasons to learnBy the way, they are all good skiers! Wish me luck! Have a wonderful visit in February. Your grandkids will get a kick out of you two skiing! I first learned to ski in 2016 at the age of 65 and proud to say Deer Valley and my awesome ski instructor Phil taught me well. Now at 66 I’m headed back for more skiing ! Deer Valley my ski home forever.